Well iOS 4.1 is finally here after Steve Jobs announced it's new features last week at the annual Apple music event in San Francisco. Mr Jobs announced many things in iOS 4.1 including bug fixes to do with the proximity sensor and iOS 4 running incredibly slow on the iPhone 3G. 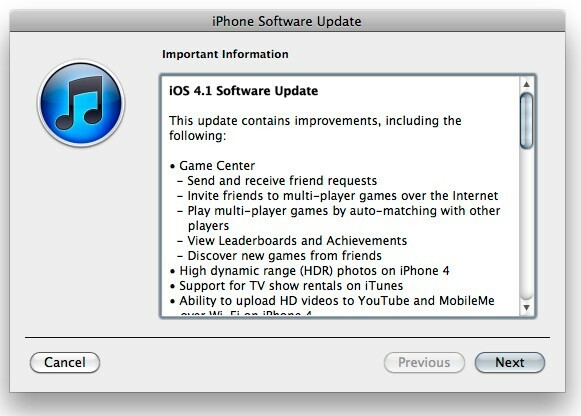 But the main features of the new update are HDR photos and the debut of Game Center, Apple's version of Xbox Live. HDR photos basically takes 3 photos, one over exposed, one under exposed and one that is normal. It then combines these and takes the best parts of each of the photos, i.e. the details in the shadows and the brightness of the sky to make a very detailed photo. While Game Center is Apple's take on Xbox Live. There are many similarities to Xbox Live, such as Achievements and online multi-player with other iOS users. There are no games available that are combaitable with Game Center as of yet but expect them soon. Also, feel free to friend me on Game Center, my user name is patrickrigby01. It is available for the iPhone 3G, iPhone 3GS, iPhone 4, iPod touch 2nd gen, iPod touch 3rd gen, and the iPod touch 4th gen, so go download it now if you already haven't!